Pirate tee is all but finished -- I just have the sewing up to do. Robin has almost outgrown it already, and I might frog a few inches and redo the neckline a bit larger. I'm not entirely happy with the shape. The sleeves are too narrow and because the sleeves were different colors I had to sew it back and forth from the underarms up, which means I have to sew up the back or stick a button on or something. Yep. I really think I'd better frog this down to the sleeves and rethink the whole thing. Bummer. 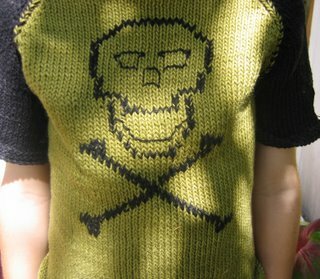 I love the colors though, and I think my skull and crossbones turned out well. I started this months and months ago, took a break to birth Finch, and now that I've dug it out of the knitting basket, I don't want to finish it. In fact, I want to rip it out and start anew. 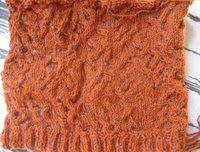 This time, instead of doing EZ's circular seamless with random cables, I might do a top-down raglan (also seamless) with a center cable or a celtic knot. Or I might do a cardigan. Or perhaps a hat and scarf set or two. I bought the yarn when it was on clearance at gotyarn because Robin looks so handsome in that color, but none of my swatches so far have inspired me. I'm going to take my time on this one, which means I'll have to buy new yarn for his Fall '06/Winter '07 sweater. Poor me. Another project headed for the frog-pond is the rompers I was knitting out of mercerized cotton for Finch. If I have enough yarn, I'll start again in a bigger size for next year. Otherwise, I'll use it to make some t-shirts for the babe. Look for more frequent, and (I hope) more interesting posts to come. Now that Finch is nicely settled (at 3 mos. old) I'm starting to have more time to do things other than nurse him, rock him, bathe him, and change him. He's a dear baby though, and the happiest little human I've ever known. A joy, to be sure, even if he is squawking at the moment because I didn't JUMP right up when first he gave cry.